well. today I have a whole day off. and I have a cold. Not to be dramatic, but I can't actually remember the last whole day off I had... I think this cold is saying - lie on the sofa and read some comics and young adult novels. and I am obeying it. I have started teaching yoga! I have two regular classes a week - one in a yoga studio and one in a gym. I love it - but it's lots of work preparing and thinking.... I also sometimes cover classes - hence the no days off. If you happen to be in cardiff or just want to know about the classes I teach, I have a facebook page you could like. So today, even tho I'm snuffly - is nice. I have books, I have the cooking channel, I have vegan broccoli cheese and bert is at work. I hope you are al well. 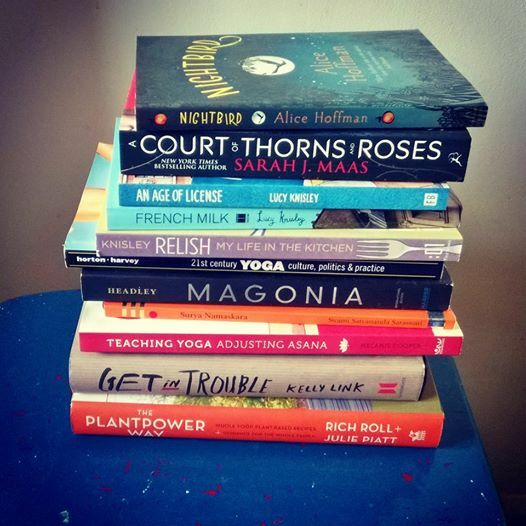 here are the books I read in June! I had some time off in June and also I got REALLY into Lucy Knisley, my favourite was Relish - a really touching and delightful graphic novel about food and cooking, and I really enjoyed her others too. Bert bought me The Plantpower Way - a new vegan cookbook/lifestyle book by Rich Roll and Julie Piatt which was totally great and had lots of pictures of Rich running without a top on. The Kelly Link book Get in Trouble is a short story collection. There were a few of these stories that didn't really do anything for me, but then there were a couple (especially summer people) which were so freaking awesome that I'm still thinking about them a good six weeks on. She is really interesting - read her if you can. Magonia by Maria Dahvana Headley is a young adult alrernate worlds fantasy novel. I loved the first half so much! So much.... But it lost me slightly when it went all out fantasy. I have since developed a huge crush on the author though and am looking forward to reading more of her books. Alice Hoffman has been letting me down recently with her novels for adults, but Nightbird (written for young adults) is back to her magical best. A total magical delight. Everyone has been reading Sarah J Maas and I wanted to try her too but I was worried that her books might be a bit too much high fantasy for me, so I decided to try A Court of Thorns and Roses which is more of a fairytale retelling. I super enjoyed it and will be trying her others too. A few weeks ago me and Rhys went to watch The Clouds of Sils Maria in the cinema. I didn't know much about it before seeing it - other than the wonderful Juliette Binoche and Kristen Stewart were in it and that Kristen won an award for it... but since then I haven't been able to stop thinking about it, and can't wait for the dvd to come out at the end of the month. It's such a great film, weird, compelling, complex, confusing... it has mainly women in it with Kristen and Juliette being just wonderful. I think we are all in agreement that Juliette is amazing anyway right? but Kristen? Kristen is so, so great. I loved her anyway before seeing this film, but now I may devote my life to her. Have you seen it? what did you think? and if you haven't go watch it and report back.